Discovering Your Inner Samurai Blog: What is Your Inner Samurai? What is Your Inner Samurai? I began calling it my Inner Samurai when I realized how strong, vast, and powerful my inner voice is. Inner because the voice is deep within my being (to distinguish it from the voice inside my head) and Samurai because of how strong and powerful it is. Inner Samurais can move mountains, leap over tall buildings in a single bound, and stop charging wildebeests in their tracks. 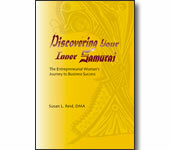 One of my clients calls her Inner Samurai her Inner Super Woman. I like that! No matter what you call it, everyone has an inner voice. It is that part of you that is the repository of all your life experiences and all your hopes and dreams. Alchemized over the years from lead into pure gold, your Inner Samurai is your greatest source of strength and knowing. It is the seat of your wisdom. It is also the place of your extraordinary uniqueness. Can you distingush the difference between the voice inside your head and the voice within? What do you call your inner voice?